The Nerdy Cyclist: Rambling on Bidons, Sinai, and the chase. Rambling on Bidons, Sinai, and the chase. I have long had a love-hate relationship with bidons. Let me explain. For several weeks now, my buddy Matt has been badgering me to ride the fast shop ride, and I finally had the chance (read: finally ran out of excuses not) to ride. The route is bascially two loops up the Mt. Sinai Rd. climb. In theory, it's not that bad of a climb, and I'm not slow, but these guys are rockets. The cracks had already started forming at the base of of Sinai, but I muscled my way up the climb in the middle of the pack, running on adrenaline and the amazement that I was actually sitting in with these guys up what is the biggest local climb we have. The inevitable crack happened at about 20 miles in. I struggled to hold wheels, but slipped steadily back through the group. Matt tried valiantly to pace me back to the pack, an effort as worthy as any Jens Voigt exploit in recent years, but my legs were long gone. The closest I got was about 30 meters from the back of the group before I motioned to Matt to go. I watched him float, seemingly effortlessly, back to the group while I lowered my head and sucked in as much air as I could, arms braced on the hoods, pedaling with that knock-kneed stroke signaling a cyclist whose mind, body, and/or soul have finally surrendered, but knowing that I still had one more assault on Sinai and I had to do it alone. And it was then, looking down with bleary eyes, pedaling only enough to stay upright, that I saw my bidons. Normally, I love my bidons. They are filled with cold liquid that quenches my thirst, balances my electrolytes, refuels my muscles, and replenishes my spirit. And I'm vain enough that I'll admit they look so damned good on the bike. At the top of a hard climb or dropping off after a hard effort, a single swig from the bidon is like drinking a magic elixir that stirs me onward. But today, as my empty legs did their best to turn the pedals over on the steepest part of Sinai, I hated my bidons. The mere thought of two liquid filled bottles conjured images of anchors (ancres if you're French) digging into the asphalt behind. They may only have weighed a few ounces, but it may as well have been tons. It was then, amidst the normal doubt and fear that clouds the mind of an exhausted cyclist with more climbing ahead of him, that I had the thoughts about my bidons I always have on a hard climb. 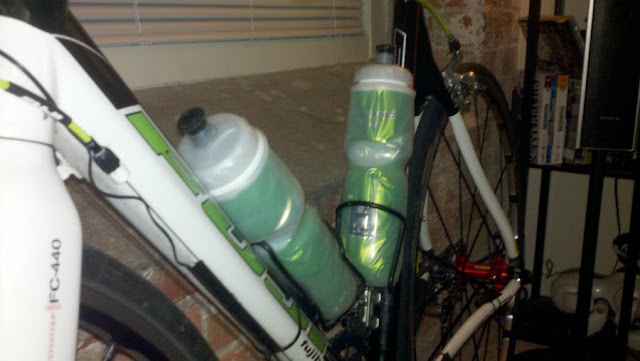 If only these bidons didn't match my bike's paint scheme so damned well. If only they weren't so damned expensive. Then I could jettison these bricks attached to my bike, and surely my legs will propel me to the summit like an eagle. A rocket propelled, two wheeled, death-eagle. But, realistically, I knew that it wouldn't make a difference. The bidons weren't slowing me down, and this damned hill wasn't going anywhere. So instead, I climbed, and I cursed. I cursed the bidons. I cursed the sun. I cursed my legs. I cursed the heat, and the humidity, and the others in the group for daring to be faster than me. I cursed the grass and the trees and the leaves because they got to sit still on the side of the road while I climbed. Basically, for the remainder of the climb, I cursed just about everything I could think of. Loudly. Creatively. I invented curses I've never thought of. I'm a bit of an artist in this sense, and suffering on the bike is my muse. I passed the church where the road flattens out to a gentle false flat. I clicked into the big ring, and tapped my right hand, going a few gears higher on the cassette. The bike responded with a gradual acceleration. I reached down and grabbed the bidon on my downtube, taking a deep drink of the delicious nectar it contained. Instantly, as the cool liquid coursed through my body, all the faults the bidon had accrued on the climb were forgiven. I looked up an could just pick out the lead group in the distance up the road. Catching them before the end of the ride wasn't likely, but it didn't matter. The pain of the climb was already a distant memory. There was still riding left to do. One more swig from the bidon, two clicks up on the cassette, and a deep breath. Come out of the saddle, damn it. Kick, kick, kick. Keep you head up. Kick, kick, kick. Shut up legs. Kick, kick, kick. Stay loose. Chase.